Teen Suicide. . . Warning Signs (Part 2). . . Teen suicide. . . the reality is sobering. It’s on the rise. And, we need to be aware. Certainly our response must be prophetic (instilling biblical hope and the reason for living in kids) and preventive (taking steps to build relationships with kids that build resiliency, for eexample). And sadly, we must also be redemptive. We must be ready to intervene. Early intervention is essential, and it begins with understanding the signs. Teenagers who attempt suicide give signs. It is estimated that about 80 percent of those who take their life communicate their intention to someone prior to the act. While they may not always communicate their pain and intentions with verbal clarity, the signs are there. But they may never be heard unless we know what to watch for. There are five categories of signs and cries that teens may give before attempting or committing suicide. Carefully read through the descriptions of the second category of these signs, realizing that they will usually appear in some combination in a teenager’s life. Sometimes an observant eye is all it takes to tell that a teen is depressed or suicidal. Here are some physical cries that you might hear as a result of being aware of your teen’s physical demeanor and day-to-day habits. Physical complaints are sometimes heard from teens who experience depression and suicidal thoughts. Stomachaches, headaches, and constant fatigue are a common occurrence among teens who are finding adolescence and the pressure of their life too much to handle. A neglect of physical appearance, characterized by sloppiness and poor personal hygiene, could be a way of saying, “Why should I bother? 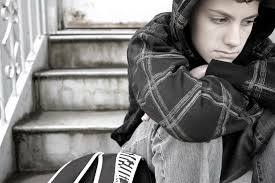 Nobody cares about me anyway.” Teens who feel worthless sometimes begin to look worthless. A change in normal eating and sleeping habits is also a sign of trouble. Suicidal teens will sometimes sleep more, eat less, and even develop one of the disordered eating patterns already discussed. Finally, body language that shows an inability to concentrate can be a sign that a child is preoccupied with problems and depression. Slouching, staring off into space, and constant daydreaming may occur when the pain of what is going on inside drowns out an awareness of what might be happening in the same room. Up next. . . the third category of signs. . .
← Teen Suicide. . . Warning Signs (Part 1). . .